January 1940 – Britain was at war with Germany. War had actually been declared in September of the previous year, but it was during the 1940s that the effects were to hit home, changing many people’s lives forever. Food rationing began on January 8th, with meat, sugar and butter the first foods to be affected, but as the war took hold more and more shortages became apparent. 1940 saw people restricted to 4oz bacon, 2 oz butter, 2 oz tea, a shilling’s worth of meat (a pork chop and a couple of sausages), 8 oz sugar, 2 oz jam and 1 oz of cheese. People were encouraged to ‘Dig For Victory’ by transforming their flower gardens into vegetable patches, and recipes appeared which used non-rationed products in so-called appetising dishes. Women were urged to ‘Make Do And Mend’ by unravelling woollens and re-knitting them, cutting-down adult garments for youngsters and transforming pillowcases and sheets into underwear. Parachute silk was sometimes obtainable, and in 1941 a Utility Mark, which looked like a pie with a slice taken out of it, appeared on products to indicate they passed government regulations regarding quality and restrictions. 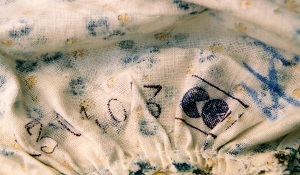 No unnecessary trims and embroidery were permitted, even on baby clothing. As items such as stockings became unavailable, young women resorted to staining their legs with gravy browning and getting a friend to draw a seam line down the back with an eyebrow pencil. They prayed that not only would the friend have a steady hand, they would not get caught in the rain. The British faced grim times – huddling in an air-raid shelter while bombs rained down was no joke – while London Underground stations were also pressed into service with many people spending their nights there, safe if uncomfortable. However, it wasn’t all gloom and doom, and a great cameraderie developed, especially amongst Londoners who bore much of the brunt of the onslaught. The younger people, especially, deemed it a great adventure, and would think nothing of racing along the streets while shrapnel rained down, dodging from one doorway to another. My mother and aunts seemed to be out dancing every night, partying with the soldiers on leave – perhaps a release from the horrors they witnessed and uncertainty they faced. No-one ever knew if their brother or boyfriend was going to be the next soldier killed, or if their family would be eradicated by a direct hit from a bomb on the house. In 1944 the terrifying Doodlebugs droned overhead; when the buzzing stopped, there was fifteen seconds to escape before they exploded. Many premises were taken over for munitions work, including doll factories such as Pedigree and Palitoy, and young women would be employed to make aircraft parts or guns; all women under sixty were required to undertake some form of war work. Sometimes, their skin turned yellow with the chemicals they came in contact with, and they were encouraged to use make-up to form a barrier on the skin. Headscarves became fashionable – they were a necessity in the factories to pro tect hair from machinery – as did wedge-heeled shoes with cork soles; leather was scarce, but the cork proved durable. Skirts were worn shorter as fabric was rationed, but hair was often kept long with plenty of curls, as women strove to retain their femininity. Thousands of ‘Land Girls’ worked on farms, and for the first time wore trousers, a freedom which women were reluctant to relinquish after the War. Of course, countless women joined the services and worked alongside their male counterparts in the war zones. Although Britons had to adapt to a more frugal way of life, they were still able to visit the cinema or theatre, and music played a vital part in keeping up morale. Dance halls throbbed to swing music; the American Glenn Miller band was a huge hit with numbers such as ‘In The Mood’, and a crazy dance called the Jitterbug literally swept girls off their feet. Forties’s films and shows included Oklahoma, Casablanca, Bambi, Dumbo, Pinocchio, Easter Parade, The Red Shoes and Brief Encounter. 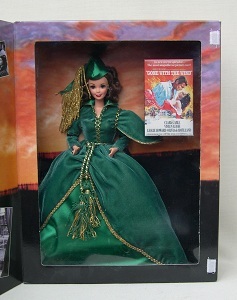 ‘Gone With the Wind’, released the year before, won eight Academy Awards in 1940. Radio programmes such as ‘ITMA’ and ‘Music While You Work’ kept the people in Britain entertained, while in Russia, Prokofiev’s stunning new ballet, ‘Romeo and Juliet’, was premiered. As so many factories had been requisitioned, dolls were not particularly easy to find, and those which were available tended to be of composition or pottery, often cheaply made and with homely faces. Nevertheless, these were the dolls which comforted children through the air-raids, and went with them when they were evacuated. 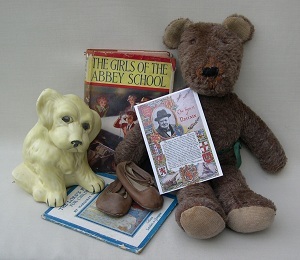 Dolls were also made from cloth, or knitted from old garments, while Norah Wellings made mascot dolls, donating a percentage of the proceeds to servicemen’s organisations. After the War, plastics began to be used by toy companies, and by the late 1940s were becoming increasingly popular. Pioneering developments were made at this time by companies such as Palitoy, Rosebud, Roddy and Pedigree, while Mormit produced a innovative soft plastic doll with detachable limbs for easy drying. 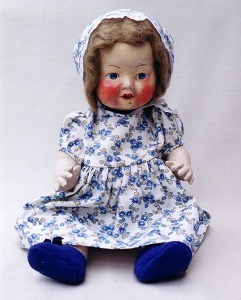 Although composition dolls were still manufactured, it was obvious that plastics was the medium which people wanted; these new dolls were lightweight, washable, virtually unbreakable, warmer to hold, and pretty, as the modelling was finer. Other developments included ‘Beauty Skin’, a kapok-filled rubbery plastic patented by Pedigree. After the war, people became a little resentful when goods and clothing were exported rather than being sold ‘off ration’. Christian Dior introduced his ‘New Look, with longer skirts, as there was now no need to conserve fabric, but in Britain, clothes and fabric were still rationed, and would be till the end of the decade. Britain in the late 1940s was feeling a bit jaded, and something new was needed. It came in the 1950s, with a new queen, a futuristic exhibition and a phenomenon known as a ‘teenager’.